We've been enjoying probiotic ginger bug sodas at our house for years. Indeed, at the autumn Herbal Retreat the ginger bug soda I brought was the first beverage gone during the weekend! I love ginger bug drinks because they are loaded with good bacteria, naturally carbonated, subtly sweet, and easy to make. 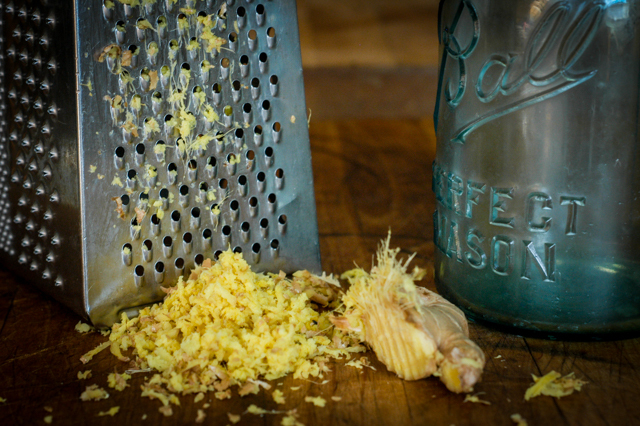 Ginger bug is one of the easiest home ferments to try. The starter calls for just three ingredients (water, sugar, and ginger) and then the final sodas can be crafter from your favorite herbal teas. It's a simple way to get some good bacteria into your diet! Ready to give it a try? Here's how. There are two steps to making a ginger bug. Like sourdough, you first create a starter. The starter is quite gingery and not a beverage in it's own right, but what you use to carbonate a sweetened tea that becomes your soda. It's important to use actual sugar (not maple, honey, or coconut sugar) for this recipe. Like with homemade kombucha, the probiotics in the ginger bug are going to eat most of the sugar (not you), and to be a strong culture they need actual sugar. I use organic unbleached cane sugar. First we'll make the starter (it takes about a week to get going). Then we'll make our drink. Each day add 1 additional tbsp grated ginger root and 1 tbsp organic sugar. Stir to combine with a wooden spoon, and replace cover. Continue feeding ginger bug daily. After approximately 5 to 10 days the mixture will begin to carbonate. (In warmer homes this happen more quickly, in cooler homes more slowly.) You'll notice bubbles in the jar, especially when stirring. Now the fun begins! Use your ginger bug to create live-fermented sodas. To use, strain off 1/4 cup ginger bug starter and add to a clean quart jar. Check your jar daily to prevent your jar from exploding under too much pressure! Burp your jar daily after the first three days to check carbonation level and prevent your jar from exploding. When soda is fizzy transfer to the refrigerator for an additional 1-4 days to finish fermenting, then enjoy! I often add a generous squeeze of fresh juice before I transfer to the refrigerator. Keep any remaining ginger bug soda refrigerated until ready to drink. Each time you remove a 1/4 cup of starter from your ginger bug, replace the liquid with an additional 1/4 cup of fresh water. Continue to feed your starter daily. If you feel you are not using your starter quickly enough you can slow it down by transferring it to the fridge and feeding with 1 tbsp grated ginger root and 1 tbsp organic sugar just once a week. When your jar begins to feel overwhelmed with grated ginger strain 1/2 of it out, compost, and continue to feed your starter. For soda flavors, try anything that would translate to a tasty sweet-sour carbonated drink. I love anything citrus and enjoy adding fresh or frozen berries, a squeeze of fresh juice, or some citrus peels to my soda during the final days of carbonation. If you're buying tea to use try sweet orange, hibiscus, or green tea. On my fourth day after adding the tea and when I went to burp the jar this morning there were small patches of mold on the surface. Did I wait too long to transfer to the fridge? The tea doesn’t seem to be fizzy yet.